An easy homemade gluten-free bagel recipe for big, soft and chewy bagels. The recipe also has a dairy-free and Vegan option. One thing I have missed so much since going gluten-free is a New York style bagel. Oh, and Panera bagels and definitely Enstine bagels too. I’ve missed big, soft and chewy bagels! 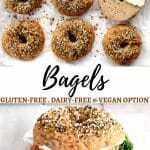 There are several store-bought gluten-free brands of bagels, but they are not quite like the bagels I’ve been missing. So I set out to make the best homemade gluten-free bagel recipe. Pre-heat oven to 100°F (bread proof) and spray an oven-safe bowl with gluten-free non-stick cooking spray. If you do not have a stand-up mixer, you can mix the dough together in a large bowl then knead by hand for 10-15 minutes. The completely cooled bagels can be stored in an air-tight container at room temperature for up to 3 days. The bagels can be frozen up to 1 month, once sliced and wrapped in aluminum foil and then placed in a freezer bag. 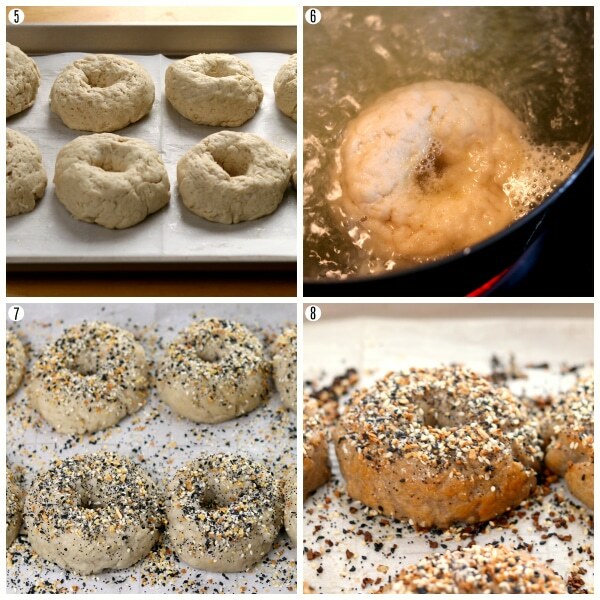 This gluten-free bagels dough can be easily turned into your favorite flavor of bagels! 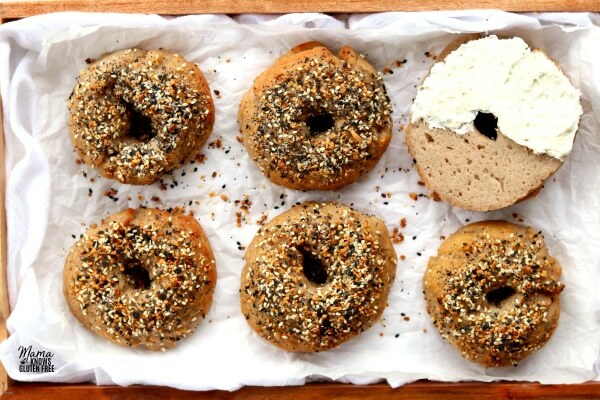 The possibilities are endless with this easy gluten-free bagel recipe. I used Pillsbury gluten-free flour for this bagel recipe. It is my favorite cup for cup gluten-free flour blend. A cup for cup flour blend is one that already has xanthan gum it. Cup for cup (or 1 for 1) flour blends makes gluten-free baking so much easier! Make sure you do not add any extra xanthan gum to your flour if it already has it in it. If you do, you will get super gummy bagels! Not all gluten-free flours are created equal. You may experience different baking results depending on the gluten-free flour blend you choose. I have found the best way to measure gluten-free flour is the “spoon & level” method. Use a large spoon to scoop out the flour into a measuring cup. Then use the back of a knife to level off the top of the measuring cup. Please do not scoop the flour directly out of the bag with a measuring cup. I have also included a dairy-free option to the gluten-free bagel recipe. There are three of us that are also dairy-free in my family-my husband, youngest son and I. So I always try and have a dairy-free option for my recipes. For the dairy-free option, I used Smart Balance butter. Now you can also enjoy a gluten-free and a dairy-free bagel. I get a lot of questions about gluten-free Vegan or gluten-free and egg-free option to recipes. For this recipe, the Vegan option, use Vegan butter and pure maple syrup in the water bath. 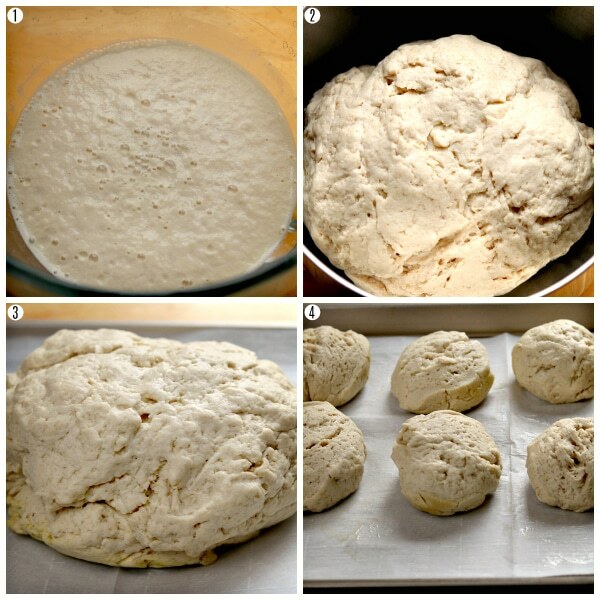 The bagel dough is naturally egg-free (omit the egg white wash step). Can I Freeze The Bagels? Yes! The bagels can be frozen up to 1 month, once sliced and wrapped in aluminum foil and then placed in a freezer bag. Thaw the bagels overnight in the refrigerator or at room temperature, then reheat or toast. 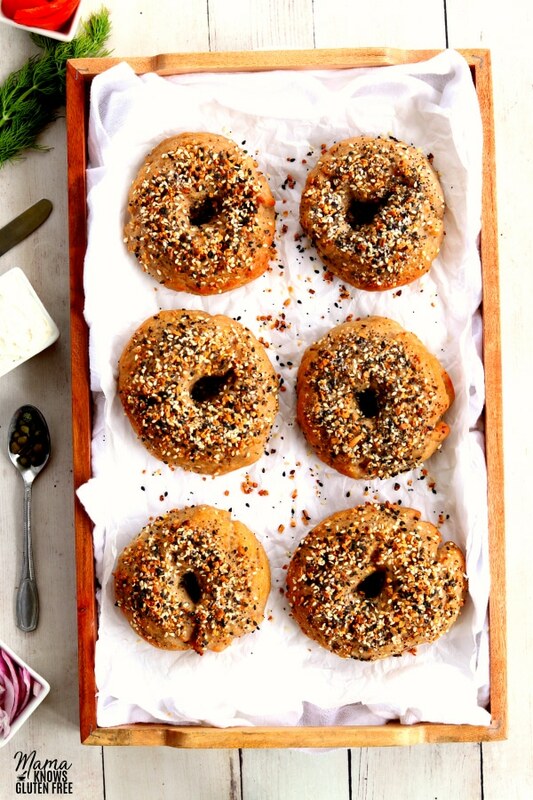 Once you make these homemade gluten-free bagels, you will never go back to store-bought again! Gone are the days of small, flat and dry gluten-free bagels. 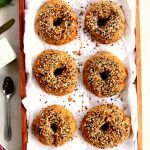 Now you can have big, soft and chewy gluten-free bagels, that are just like you remembered them to be! My favorite way to eat bagels are with locks and cream cheese (dairy-free), but my kids love to eat them plain. They are perfect for making sandwiches and even for making mini pizzas. 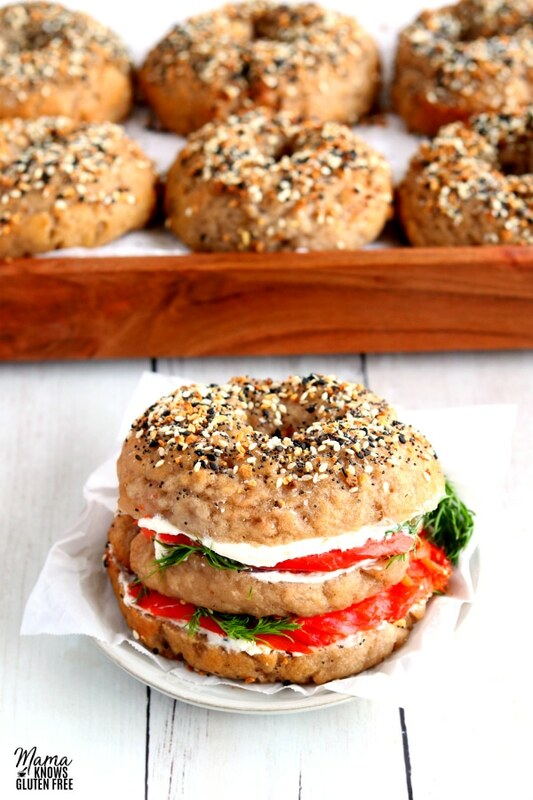 There are so many ways you can enjoy gluten-free bagels! More Gluten-Free Breakfast Recipes To Try! In the bowl of a stand-up mixer add the granulated sugar and warm water, stir to dissolve the sugar. Add the yeast and stir to combine. Cover with a kitchen towel and let sit for 5 minutes, until it becomes frothy. Add the flour, xanthan gum (leave out if your flour already has it), psyllium powder, baking powder, salt, and brown sugar to the yeast mixture and beat on low speed for 2 minutes the dough hook attachment. Add the butter and apple cider vinegar and beat on medium for 5 minutes, until dough is sticky and stiff. Transfer the dough to the greased oven-proof bowl and cover with plastic wrap and then a kitchen towel. Place in the oven to rise for 20 minutes. Line a baking sheet with parchment paper. Turn the dough out onto the parchment paper and cut into 8 pieces. Roll each piece into a ball. Press your finger through the center of each ball to make a hole about 1 inch in diameter. Cover the shaped bagels with a kitchen towel for and let rise on the counter for 10 minutes. Pre-heat the oven to 425°F. Add 2 quarts of water in a large pot. Whisk in the honey (or maple syrup). Bring water to a boil, then reduce heat to medium-high. Drop bagels in the boiling water 1 at a time and boil for 30 seconds and then flip the bagel over and boil for 30 more seconds. Using wire skimmer or slotted spoon, return the bagels to the sheet, right side up, with flat bottoms against the sheet. Repeat until all the bagels have been boiled. In a small bowl whisk together the egg white and water. Brush the tops and the sides of the bagels with the egg white mixture. Sprinkle with seasoning if desired. Bake the bagels on the middle rack for 10 minutes and then turn the baking sheet and bake for an additional 15 minutes, until the tops are golden brown and the internal temperature reaches 180°F. Please watch your oven because all ovens are different. Remove from the oven and allow bagels to cool on the baking sheet for 20 minutes before serving. Enjoy! The completely cooled bagels can be stored in an air-tight container at room temperature for up to 3 days. The bagels can be frozen up to 1 month, once sliced and wrapped in aluminum foil and then placed in a freezer bag. Thaw overnight in the refrigerator or at room temperature, then reheat or toast. The best way to measure gluten-free flour is the “spoon & level” method. Please do not scoop the flour directly out of the bag with a measuring cup. For the dairy-free option, I used Smart Balance butter. The completely cooled bagels can be stored in an air-tight container at room temperature for up to 3 days. The bagels can be frozen up to 1 month, once sliced and wrapped in aluminum foil and then placed in a freezer bag. Thaw the bagels overnight in the refrigerator or at room temperature, then Thaw overnight in the refrigerator or at room temperature, then reheat or toast.